Most of the time trees are cut during construction. 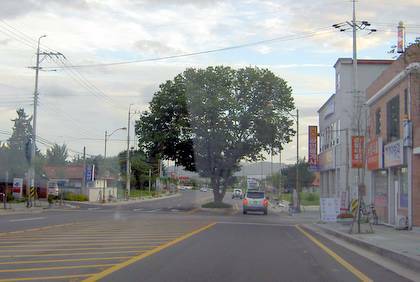 In this case, the road is built around the tree. Along road 47 in Ildong, Gyeonggido. Koreans are amazing in that respect. In Gwacheon ê³¼ì²œ, South of Seoul, they even put floodlights underneath the trees so that their beauty could be seen even at night. have you tried using this dictionary from quick find? I think I saw this on TV many months ago. (maybe even years) Isn’t it anywhere near a school or something?